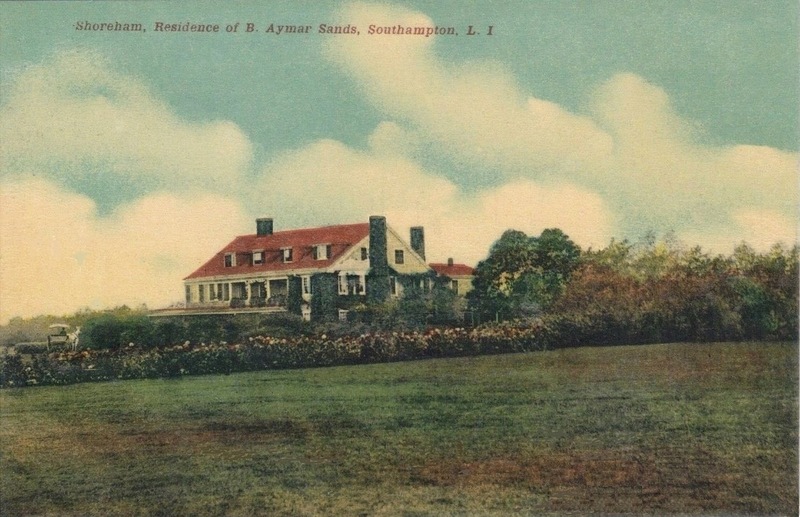 The Benjamin Aymar Sands estate built in the last decade of the 19th century on Great Plains Road in Southampton. The estate had landscaping by the Olmsted Brothers and Warren H. Manning. Sands, an attorney and partner at the firms of Webb & Sprague and Bowers & Sands, was vice president of the Colorado Midland Railroad Co. and the American Mortgage Company. He was also chairman of the board of British and Mercantile Insurance Co., London. The residence was demolished in 2002. Demolished in 2002 & replaced with what? BT...good eye. Definitely looks like a match. Of course it was demolished. Big comfortable unassuming house, no doubt full of light with an open easy floor plan---what young titan of finance would find that adequately chest thumping (or over-designed) for his needs? It made it from the 1890s to 2002 and was demolished?? Aaaaaghhhh! I agree that the match BT identified is impressive. I compared the two & it made me aware that the chimney in the foreground of the postcard is odd -- the stack stops nearly level with the roof. It also does not match the chimney in the photograph, where the chimney is inside the roofline & not at the end of the house. I believe they are the same house; I just wonder why the postcard was altered?